This is Bo’s first Father’s Day without his Dad and I think today he is remembering all the great fishing trips he made with his Dad who really loved their trips to Mexico and Brazil. 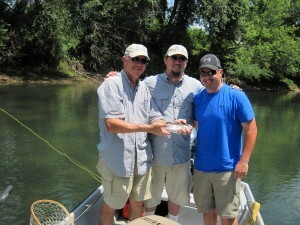 We had a couple of special days with Jason and Bryan who brought their Dad, Ronnie, on their first ever fly fishing trip. The low water, bright sunshine and high temperatures made for difficult fly fishing but these guys are fast learners and they caught a bunch of nice Rainbows on size #16 Sowbugs. 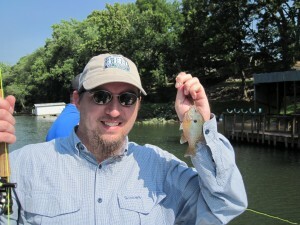 Bryan even caught a couple of beautiful little Sunfish. The boys and their Dad really had a great Father’s Day weekend during their first fly fishing trip. Hopefully they will make this an annual event. Bo thinks that I am a pretty smart dog and I think if more fathers and sons went fly fishing together the world would be a better place.